Kross, E., Verduyn, P., Boyer, M., Drake, B., Gainsburg, I., Vickers, B., . . . Jonides, J. (2018). Does counting emotion words on online social networks provide a window into people’s subjective experience of emotion? A case study on Facebook. Emotion. Verduyn, P., Ybarra, O., Resibois, M., Jonides, J., & Kross, E. (2017). Do social networks sites enhance or undermine subjective well-being? A critical review. Social Issues and Policy Review. Verduyn, P., Ybarra, O., Jonides, J., & Kross, E. (2017). Social media and happiness: The case of Facebook. La Revue québécoise de psychologie. Park, J., Lee, D. S., Shablack, H., Verduyn, P., Deldin, P., Ybarra, O., . . . Kross, E. (2016). When perceptions defy reality: The relationships between depression and actual and perceived Facebook social support. Journal of Affective Disorders. Verduyn, P., Lee, D. S., Park, J., Shablack, H., Orvell, A., Bayer, J., . . . Kross, E. (2015). Passive Facebook usage undermines affective well-being: Experimental and longitudinal evidence. Journal of Experimental Psychology: General. Kross, E., Verduyn, P., Demiralp, E., Park, J., Lee, D. S., Lin, N., . . . Ybarra, O. (2013). Facebook use predicts declines in subjective well-being in young adults. PLoS One. Commentary: Shen, H. (2013). 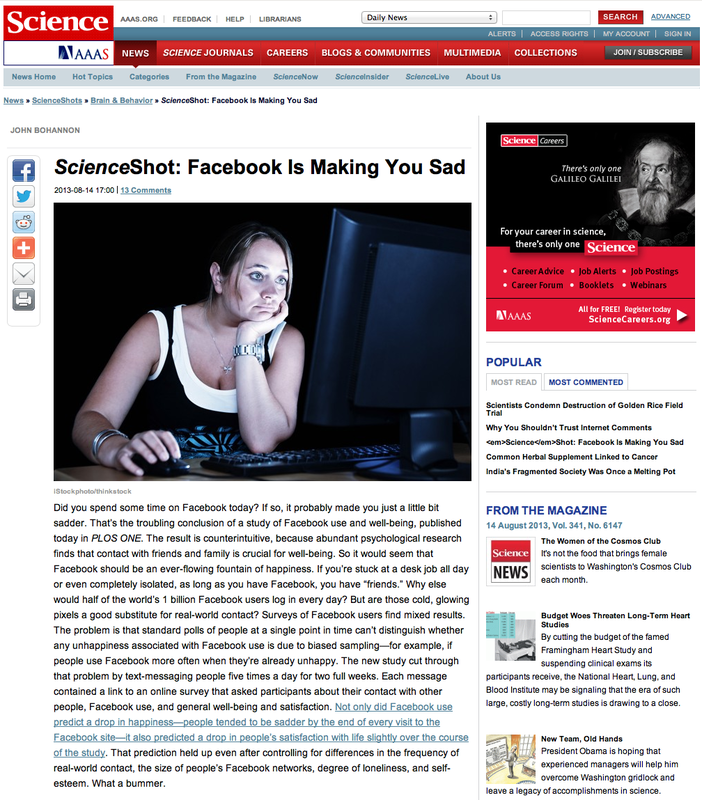 Facebook is making you sad. Science. Commentary: Facebook is bad for you: Get a life! The Economist.